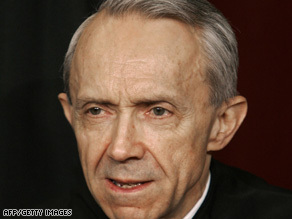 After more than 18 years on the nation’s highest court, Supreme Court Justice David Souter is retiring, a source close to Souter told CNN Thursday. Souter will leave after the current court term recesses in June, the source said. Filling Souter’s seat would be President Barack Obama’s first Supreme Court appointment — and the first since George W. Bush’s picks of Samuel Alito in 2006 and Chief Justice John Roberts in 2005. Souter, 69, was tapped for the court by President George H.W. Bush in 1990, but disappointed many conservatives when he turned out to be a typical old-fashioned Yankee Republican — a moderate, with an independent, even quirky streak. Souter’s departure will leave the two oldest justices — and the most liberal — still on the bench. Retirements for John Paul Stevens, 89, and Ruth Bader Ginsburg, 76, have been rumored for years, with many expecting that one or the other would be the first to give a new Democratic president a Supreme Court vacancy. Souter’s decision came as something of a surprise, although he has long been known to prefer the quiet of his New Hampshire farmhouse to the bustle of the nation’s capital. Gay Marriage: Is California’s Supreme Court Shifting?